This is my last Christmas theme bento and the last one for this year. I made a simple fried rice bento covered with omelet, decorated with egg sheets to form our family. From here, although it's a bit early, we want to wish you a joyous Christmas! Our family has been so blessed through out this year, in bad times or good times ... God is always watching over family. I'm personally want to thank you all for your supports via comments, emails, tweets all this time. I really appreciate the friendship through this blog with all of you, I really do. Tomorrow, kids will have their school Christmas celebration and it will be a final day of school for this semester. They will have school break until 9 January, 2011. So the second semester will start again on 10 January, 2011 where I will begin my bento making again. So now, it's time to enjoy the holiday. We will depart from Jakarta this Sunday to our holiday destination, Maldives. And later we will stop by in Singapore to celebrate Christmas there. And back to Jakarta again to celebrate the New Year with our families and friends. Hope all of you enjoy and have fun holiday with your family and friends! I wish you a Very Merry Christmas and that 2011 brings you all the best, for you and your pretty family. Aw, and I've been so enjoying your holiday bentos! I love this family portrait one. Lia, I am so lucky to have met you here and on twitter. It is I, who feels privileged to have met you! Have a wonderful time on your xmas holidays. Enjoy your family time together! Hope you pop in some times during your vacation. : ) Happy Holidays to you and your family and enjoy the New Year! Merry Christmas & Happy Holiday to you and family. Enjoy the trip and take as many photos as you can to share with us late...hehe. Merry Christmas Lia, I'll sure miss your bento!! Wish you & family a great holiday! AWWWW!!!! This is so so so sweet and lovely!!! Oh my~how lovely is the bento.. So sweet; thank you for the family Christmas card. I love it! Have a wonderful break-- you get a week longer than us! Sounds like a fun travel itinerary for you and the family. Enjoy! A beautiful bento that expresses family love and togetherness so well. Your holiday plans sound so special and I hope they will prove memorable and joyous. Thank you for all the bento love and friendship you share, Lia...this, along with your magical bento art, makes you such a radiant star in our community. Peace and blessings to you and yours! Merry Christmas! Ive just discovered your blog and absolutely love it. This is my first Christmas married to my husband and for us Christmas is always a big deal. Definitely the time where you appreciate all the loved ones who your blessed to have sharing your life. We celebrate Christmas day with our family then have the following Monday as a "Christmas" for close friends with a ornament exchange so that we all have a wonderful memory every year when dressing our tree and also its not too expensive. Hope your family has a absolutely lovely Christmas. This is super cute and nice! What a sweet bento! I hope that you have a wonderful holiday and enjoy your trip! It's been so much fun seeing your beautiful bento creations and I can't wait to see beauty you make in the New Year! Merry Christmas!! Have a wonderful time with your family. See you next year! 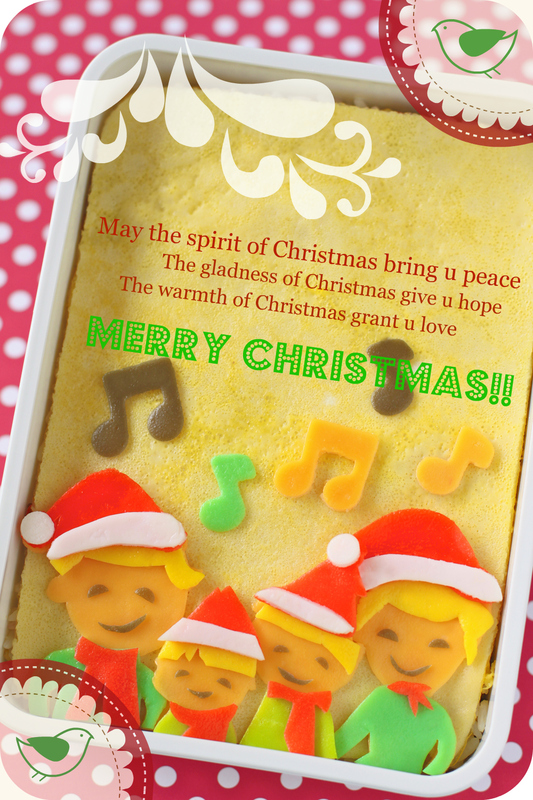 What a cute family caroling bento, wishing you a Merry Christmas and a Blessed New Year! It's a lovely xmas bento!you're always great in bento-making.Thumbs up to you! Have a blessed Christmas & Happy Holiday! Wow, what great Christmas carolers! Can't wait to see your new bento next year! Hope you had a merry Christmas with your family ! See you next year for beautiful bento !